One New Aftermarket Replacement Pair of Right Hand & Left Hand Side Hood Moldings (with Raised Lettering) for John Deere Tractor models: 1010, 2010, 2510, 2520, 3010, 3020, 4000, 4010, 4020, 4320, 4520, 4620, 5010, 5020.- Painted & Ready for Installation. JD New Generation Side Moldings. Includes Mounting / Retaining Clips. Pair Contains: 1 RH Side Molding # AR28048, & 1 LH Side Molding # AR28049. Just like they came right from the Factory. Our processing system is automated. Thank you for your continued patronage. We carry parts for Engines, Transmissions, Front & Rear Axles, Hitch & Drawbars, Undercarriages, Final Drives, Seats, Bearings, Cups, Cones, Seals, Discs, Couplers, Gears, Brakes, Pressure Plates, Pilot & Throw Out Bearings, Ring & Pinions, Gaskets, Decals and MORE for most high wear items. We also carry replacement parts for the Boom Cylinder (Seal Kits, Tubes, Glands, Pistons, Rods). 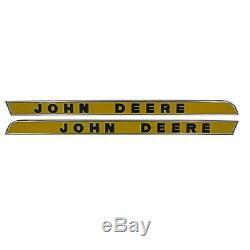 The item "John Deere Tractor Side Hood Molding LH RH Raised Letters 1010 1020 2510 2520 +" is in sale since Thursday, March 1, 2018. This item is in the category "Business & Industrial\Heavy Equipment Parts & Accs\Antique & Vintage Equip Parts".